Let's build a gable vent. Choose the grade of vent you need. Offering gable vents with limitless options, styles and colors to ensure the right gable vent every time. Build the gable vent online with our builder and Onyx Xteriors will manufacture the same vent options you choose and ship it right to your door. All our gable vents are manufactured from aluminum even the frame. There is no wood in these gable vents. There is also no staples to hold them together. We use real aluminum pop rivets. The Signature Series gable vents have no option limitations of customization. Customize these gable vents as far as you need. Custom gable vents are what we do. 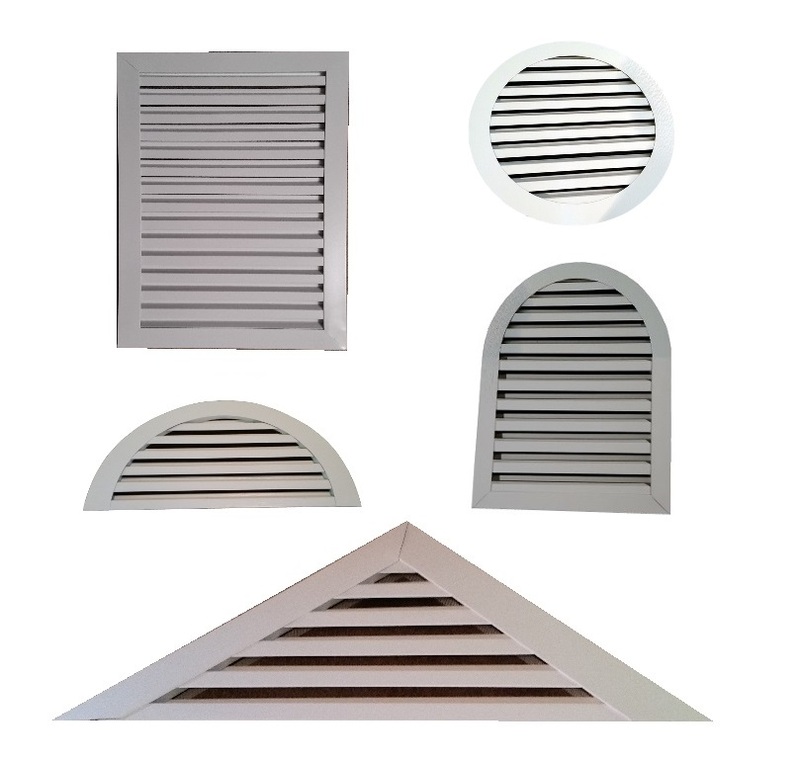 This could include for a custom vent trim or custom vent shape and even a custom louver. Gable vent flange options of standard are front flange gable vents, back flange, no flange and j flange. But you can even order a custom gable vent flange for a special application. Contractors run into different install issues every day and these issues cannot always be foreseen. This is where a custom gable vent can really come in handy. Not to mention the 4 fold aluminum louvers. The aluminum sheet metal used is a .019 that you may use on siding jobs and window jobs. What sets our gable vents apart is the added advanced technology in our gable vent products. The gable vent louvers have a 4 fold hem on the front bottom of the louver and a double reversed hem on the back to make the louver rigid and stiff. These aluminum louvers are as strong as a galvanized gable vent. Some makers of vents will use a wooden frame to make them stiff and hold everything together. But this is one item where you can determine if the gable vent is made or manufactured. Manufactured gable vents will have a frame of the same material they are made from. We use an aluminum rail to make the louvered vent stronger. We also manufacture our gable vents with pop rivets instead of stapling them together. Staples have a tendency to rust out and leave the louvers to drop. As the frame of your home is important to hold the home together, the frame of a gable vent is what holds your gable vent together. There are no restrictions on the height or width of these gable vents. 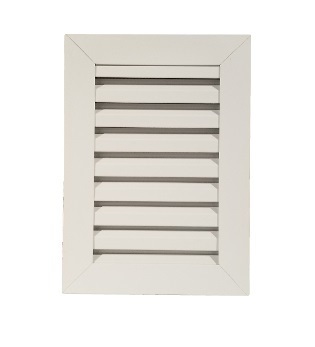 You can order your gable vent as small or large as you need. For triangle gable vents, we also list the most common base length sizes for easier ordering. Shopping for a gable vent can be a headache and we want to make it as simple as possible. What about common square gable vent sizes? These square gable vent sizes are listed as height x width. Maybe you need a square vent of a lesser cost. We offer a contractor grade square gable vent, but they do have a few size limitations of size max 24" for louver strength. Round gable vents are more simple as they are the same height as the width of the vent. Octagon gable vents are also of the same height and width. We also offer a wide range of Tombstone Gable Vents, Half Round Gable Vents, Cathedral Gable Vents, Left Triangle Gable Vents and Right Half Triangle Gable Vents. The left and right triangle gable vents are usually used beside a chimney where a single gable vent will not provide enough ventilation. Tombstone gable vents add style to plain gables where the better ventilation is in height not width. Cathedral also serves this same purpose. And a half round gable vent is usually used where a gable is short and squatty to give more style than a regular triangle. Gables of homes are the pinnacle of the castle and should be treated as such for their beauty and functionality. Choosing the right gable vent can be just as much eye candy as the right flowers for curb appeal. In fact, our decorative gable vents have stopped traffic many times. People learn about some of our gable vents by stopping by a house that already has our gable vents and asking the homeowner where they got it. This says a lot about Onyx Xteriors gable vents for quality, visual and durable vent products. Make your home eye candy for your neighborhood with gable vents from Onyx Xteriors.